The Cordata/Meridian neighborhood Market Statistics for the month of February shows the active, pending & sold homes in the Cordata/Meridian area of Bellingham Real Estate Market. Whether you are looking to sell or invest in a home, the provided information below will help you in making an informed decision. The Chart below compares the historic median price of sold and active inventory in the Cordata/Meridian neighborhood. Neighborhood inventory is the number of active properties on the market and the number of homes sold in the Cordata/Meridian neighborhood. 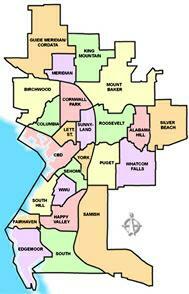 * Included in this report is the Cordata/Meridian neighborhood distressed properties. More likely than not these properties has an impact on the prices in the neighborhood. If a given NB has 5 distressed properties out of 6 sales, you can pretty much guarantee that the sales prices are going to be lower than in a non-distressed transaction & thus, have a declining effect on the neighborhood market, as well as, over all the Bellingham real estate market.